2014 was an amazing year for K-9 Angels Rescue. We flourished in our Adoption Center at 2125 W. Alabama. Because of the fantastic volunteer crew that we have established, K-9AR saved 714 dogs from high kill shelters this year! That is 202 more dogs than we saved in 2013!! Since we started K-9AR in Feb 2012 we have rescued and found good homes for 1576 dogs. That is pretty cool. We had three super fundraisers in 2014 thanks to a great fundraising team. We started with our Spring Fundraiser at Cottonwood which raised almost $17k and set the bar for fundraising events compared to past efforts. Then we had the Best Friends Animal Society “Strut Your Mutt” fundraiser. K-9AR raised nearly $70k and was the third highest fundraising team in the country, earning us another $2,500.00 from Best Friends!! This was totally because of the dedication of our volunteers. Then we finished off with the really fun Karbachs Brewing event which raised $30k. So what are we going to do with the $$? Well, as most of you know, we unfortunately had to vacate the W. Alabama Adoption Center due to early progress on its commercial development project. Our current Adoption Center at 2409 Montrose is not ideal but gives us a couple of months of breathing room. We are still actively looking for a more permanent solution (either a donated spot for a year to 18 months or an affordable lease in a decent location for that period of time). But the hypercritical Houston real estate market is very challenging. Concurrently, the Board has approved moving forward on building a permanent AC / Kennel / Quarantine facility on an acre of property that Mary Tipton and I own in Old Spring Branch. While this is only in concept stage we hope to rapidly progress moving forward on building a state of the art permanent facility. Additionally, as we increase rescues, the expenses of handling more dogs continues to go up so we are always looking to keep our head above water financially. And finally, we continue to progress efforts to raise awareness of Spay & Neuter and responsible dog ownership in our Houston Neighborhoods. I hope everyone of you has taken great satisfaction in the lives you have saved, the friends you have found and the difference you have made for Houston in general, and individual families who have adopted our dogs in particular. We are looking forward to working with all of you towards another very successful, challenging and amazing year in 2015! It’s okay! It’s nearly the end of the year, but there’s still time! Please consider making a tax-deductible donation to our non-profit rescue. Every penny donated goes toward helping the dogs currently in our care and to help us continue to be able to save more and more dogs down the road. We can’t thank our supporters enough — without you we wouldn’t be able to do what we do! Here’s the link to donate via Paypal. It is the easiest and quickest way to help. No donation is too small! While most everyone is busy preparing for the year end celebrations, some may have forgotten to also prepare for their pets. 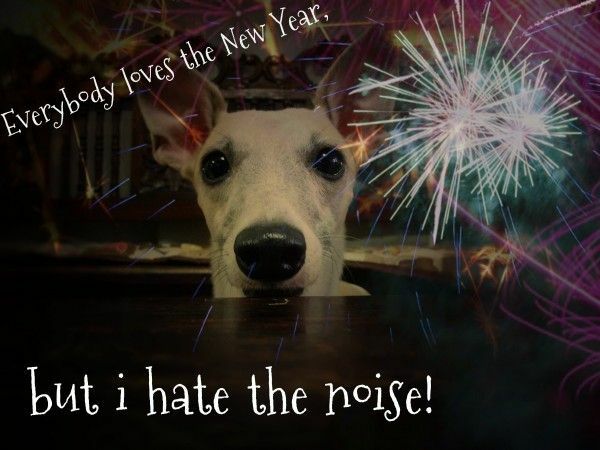 There’s still time to make this New Years eve a safe and happy one for your pets. Big gatherings, loud noises, and startling fireworks are some of the things we love about the holidays but they can be very frightening for our pets. With a little planning and precaution, you can ensure that this New Years eve celebration is enjoyable for everyone. The biggest risk of all this New Years eve is that pets will get loose and become lost. Even if a pet is secured inside, the sound of noisemakers, gunfire, and fireworks can cause them to enter an extreme panic mode, sometimes even breaking through glass windows, slipping out doors or pushing through screens. Make sure your pets are licensed and micro-chipped. Make sure the microchip company has your current address and phone numbers. If anything, collar and tag every pet in your home now. Descending remnants of scorching novice fireworks, bottle rockets and stray celebratory bullets could cause serious injury or death to your pet. Therefore, keep the outside visits to a minimum. This night is different, remember, anxiety can surface in the most fearless of dogs and most laid back cats while courage from alcohol can come out in the most passive of humans. Being an amateur drinking night, intoxicated neighborhood visitors may find humor in letting your unattended pet out of your yard or worse intentionally inflicting harm upon them. When your pet must go out to relieve itself, please accompany it and use a leash with a snug fitting collar or harness. If you’re having guests over, consider keeping pets in a room that’s off-limits to guests with plenty of water and pet food. People coming in and out while not paying attention can be a perfect way for your anxiety stricken pet to escape. Any pet can easily choke on the blower attachment of party horns or portions of party hats. Plastic Hawaiian neck leis commonly used at parties can also prove deadly when becoming lodged in the throat. Ingestion of certain party foods can be fatal if your pet find it’s way to the snack table or overflowing waste baskets. Don’t risk any of these things happening to your loving companion. Keep your pets in a safe enclosed room, with doors, windows and blinds closed. 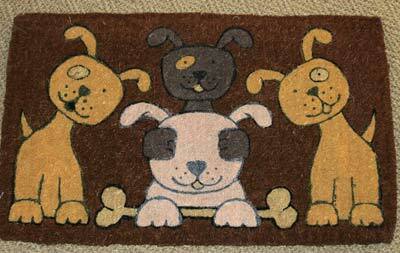 Surround pets with their favorite toys and other familiar objects. Sometimes the smell of an article of clothing from your laundry can help comfort them. Chew toys or non ingestible chew bones are great to hold attention. Have several on hand and change them out for different ones throughout the night. Create a space in the room for them to find refuge. Either an open door crate you are sure they will utilize or under a coffee table or perhaps behind a chair or couch. Just place their comfort items in this hiding place for them to relax. Play soothing music or turn on the television. Keeping them occupied by the sound in the room and slightly masking the outside booms, crackles and horns is the key. Taking into consideration that fear, anxiety and confusion can cause fear aggression in any pet, with one of your visitors being the target, is yet another safety reason to place your pet in a private and calming area of the home. End of year celebrations with family and friends can be most enjoyable while reminiscing about the years memorable happenings. Don’t let a lost or injured pet be a bad ending to a wonderful evening. An animal rights group’s investigation uncovers Chinese factories that make leather products from dog skins. The next time you go shopping for leather gloves, you might want to ask yourself an unsettling question: Did that accessory come from the skin of a family pet in China? People for the Ethical Treatment of Animals last week released a video shot by an undercover investigator showing dogs at a factory in China’s Jiangsu province being butchered not only for their meat and organs — considered delicacies in that country — but also for their skin, which is tanned and sold as leather on the world market. PETA said it visited three slaughterhouses and six processing plants during a one-year undercover investigation. One slaughterhouse employee told PETA that the facility kills and skins 100 to 200 dogs each day. “Although the dog-meat industry in China is well known, this is the first time that PETA Asia has captured the production of Chinese dog leather on camera,” the group said. Most of the world’s leather products, including gloves, belts, shoes, purses, and other accessories sold in the United States, are produced in China. Ashley Byrne, a PETA campaign specialist, said the Chinese dog leather industry has been thriving for years. Where do all those doomed dogs come from? Byrne said that a small number are raised specifically for their meat, skin, and fur, but the vast majority are either pets that were kidnapped from their owners or dogs rounded up on the streets of Chinese cities and villages. Short of conducting a DNA test, there is no easy way for importers, retailers, or consumers to know exactly what type of animal any leather product is made from. The United States Fashion Industry Association and National Retail Federation did not respond to requests for comment on dog leather products, while an official at the American Association of Exporters and Importers said the group had no information on the practice. The Dog and Cat Protection Act of 2000 calls for the seizure and forfeiture of each item and penalties of up to $10,000 for each violation. That law, however, has not stopped the import of dog fur from China passed off as raccoon fur, including a 2012 incident involving Neiman Marcus and, the following year, designer Marc Jacobs. As far as PETA is concerned, slaughtering dogs for their skin is little different from using cows or sheep for the same purpose. “The difference is that most people are more familiar with dogs than they are with cows,” Byrne said. Just wanted to share this with you. They are already BFF’s. 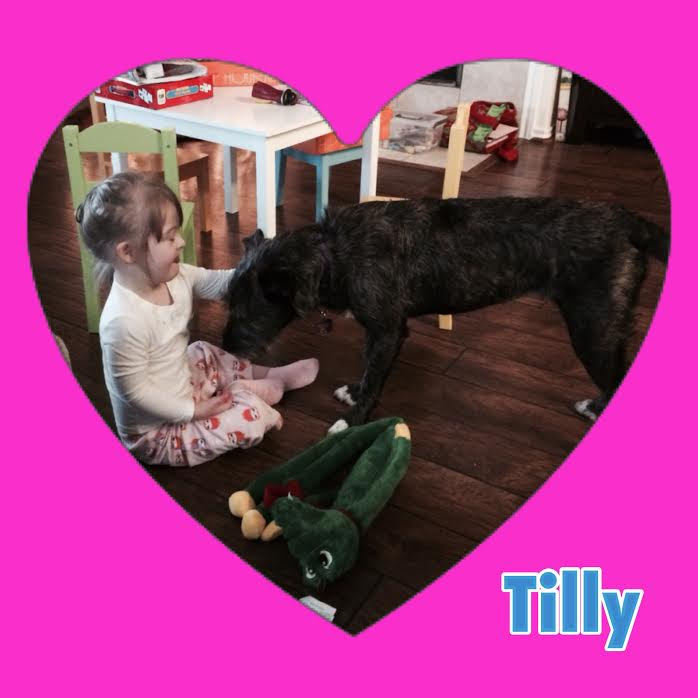 Tilly had a great first night and we are so in love. Thank you for everything your organization does! It’s the holidays and everyone is busy with holiday things, but you dedicated K-9 Angels volunteers don’t ever stop working for dogs in need — even through the loss of your adoption center on Alabama :(. I wanted to take a minute to tell you how precious our K-9 Angel is to us and our family. We (Donna Walker and Ginger Gross) adopted “Einstein” from you guys on July 27, 2013. We had a brief moment there where there were issues getting Einstein AKA “Bogey” to acclimate to our household with our cat and older German Shepherd (from Greater Houston GSD Rescue) and we almost brought him back. Little did we know the tremendous joy he would bring to our lives daily. He is so loving, so fun, so obedient. We can’t imagine why anyone would have let him go, but we are so happy we found each other. He makes us smile EVERY day. Thank you so much for the awesome work you do! We are a testament to the difference you are making in people’s, as well as dogs’, lives. 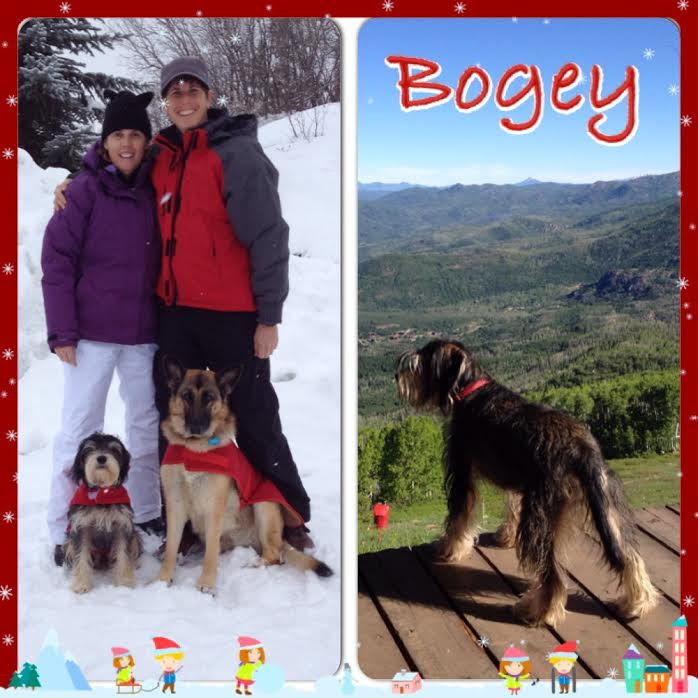 I’m attaching a couple of pictures of Bogey in one of his favorite places to visit — Steamboat, Colorado — one from a hike this past summer with a pit stop on one of the lift decks, and a family picture from last Christmas. Thank you again, a thousand times over. Keep up the great work! Dear K-9 Angels Rescue:It’s been a little more than a year since Harper (formerly Gretchen) joined our family. I can’t even begin to describe to you the joy she has brought to our lives and the overwhelming love we have for our little princess. She has the most amazing little personality and a ton of quirks that keep us laughing all the time. For being so tiny, it is her mission in life to tear the stuffing and squeaker out of toys in record timing. She can wrap herself into a blanket burrito with ease, and her favorite thing in the world is to “help” load the dishwasher. The many faces of Harper make me smile, laugh and melt my heart all at the same time. But it hasn’t been an easy year by any means. In fact, we almost lost her several months ago. Not really understanding the real dangers associated with them, we had two tall sago palms in our back yard. While pruning them, Harper got a hold of one of the sago “pups” that fell to the side. Within hours she was vomiting heavily and we took her to the emergency vet. It was only then that we became aware of how dangerous and deadly these plants are to pets. Most dogs, our vet informed us, do not survive sago palm ingestion. Harper’s health continued to decline over the next few weeks with liver values off of the charts. At one point we were told she would likely not make it another week and to prepare for euthanasia when things got really bad. So we made a bucket list for her, which we completed over the next few weeks, and even took her to our church to be blessed by our priest. I don’t know if it was medicine, miracle or a little of both, but Harper pulled through. Her health improved and you would never know anything is wrong just by looking at her or playing with her today. But it is. Even though she survived the initial trauma from the sago palm ingestion, a subsequent liver biopsy determined she has developed chronic hepatitis from the incident. We manage it with six medications daily and a special prescription hepatic diet. There are no guarantees of how long she’ll live with her diagnosis. (But her last two blood work results were perfect which is a great sign!) But what I can guarantee is that she’ll be loved every single day. I hope you can join me in spreading the word to current and prospective pet owners about the dangers associated with sago palms. These plants are so dangerous and deadly that anyone with a sago palm in his or her yard should not be allowed to take home a pet until the plants are removed. 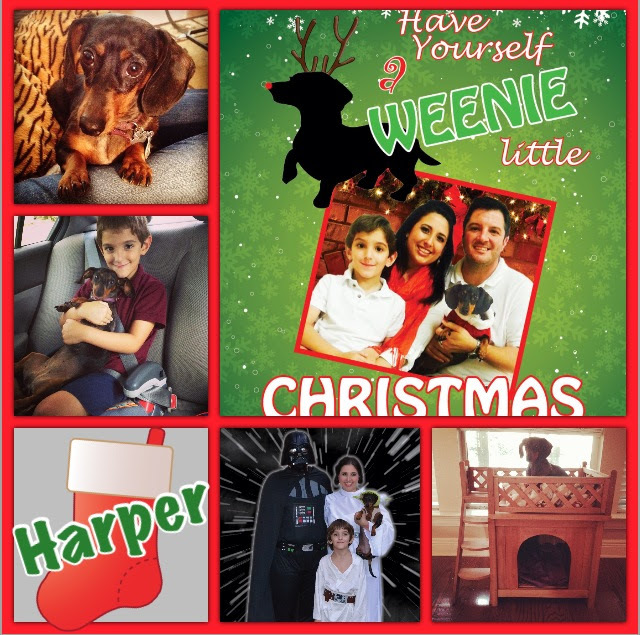 I have heard personal accounts and read online the details of many pets that weren’t as lucky as Harper. I consider myself very blessed that she is still with me, and I hope to make a difference by creating more awareness so that others don’t go through what we did. That is a priceless Christmas gift you can give to the pets in your care and their future pet parents. Thank you again for bringing Harper together with our family. She has truly been a blessing and brings us happiness every day. We hope the entire K-9 Angels family has a very Merry Christmas!